Stylishly cool, sustainable, and part of the one lid three sizes coffee cup collection, this clean white disposable cup is made from durable and recyclable paper. These sleek coffee cups are rippled and insulated to keep hands and fingers from burning. Ripple-walled and designed with a chic white design, this coffee cup is perfect for serving coffee, teas, hot chocolates, macchiatos, lattes, mochas, and just about any other freshly brewed hot shot of java. Each One Lid Three Sizes White Disposable Ripple Wall Coffee and Tea Cup holds up to 12 ounces and is shipped in bulk in a 500 count box. Lids are sold separately. NO NEED FOR SEPARATE SLEEVES: These versatile, 12-oz white paper cups alleviate the need for separate sleeves, lessening your impact on the environment while saving you money in the bargain. Lids are sold separately. KEEP THE HEAT IN: With the insulated, ripple-wall design, hot coffee and tea stays at a drinkable temperature while your customers’ hands remain cool. MADE FOR RECYCLING: Constructed with 100% paper, these nature-friendly coffee and tea cups are recyclable. 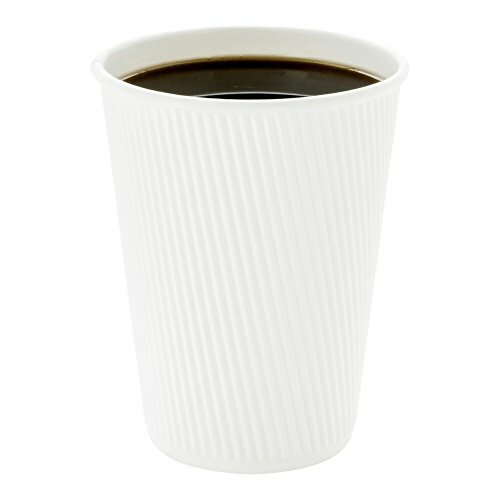 SOLD IN BULK: For affordability and convenience, these coffee cups are shipped in bulk in a 500 count box.